Government plans to privatise huge elements of police work indicate a decisive shift to private provision within the criminal justice system. Is community safety a commodity to be bought and sold? 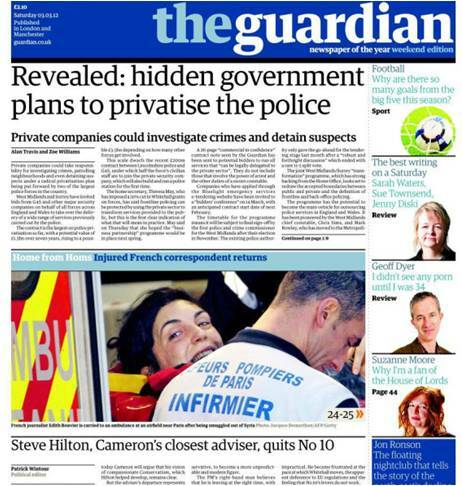 We are now closer to large scale privatisation of policing than ever before. The Guardian has revealed that West Midlands and Surrey police (two of the biggest forces in England) have offered a contract worth £1.5bn over 7 years, which will allow private firms to investigate crime, to detain suspects and to patrol the streets. Should other forces become involved, the figure for the contract may rise as £3.5bn. This indicates that the previous £200m deal made by G4S and Lincolnshire police to run a police station look like the tip of the iceberg. West Midlands police also contracted out some of its anti-terror operations to G4S, but this again pales into insignificance compared to the proposed scale of privatisation in the West Midlands and Surrey forces. This is clearly a sea-change in the shift to private provision within the criminal justice system. The West Midlands and Surrey forces (two of the biggest in England) have invited bids from private companies, including G4S, to deliver a range of services previously undertaken by the police. The Guardian has had sight of a 26-page “commercial in confidence” contract note sent to potential bidders to run all policing services that “can be legally delegated to the private sector” (i.e. excluding the power of arrest). The anticipated start date for delivery of these new privatised services is thought to be in February 2013. It is now becoming clear that what she meant: increasing private provision in policing, in addition to the biggest cuts in police numbers in a decade. What might privatisation involve in practice? As early as next spring, we might expect to see private companies running a range of police activities, including the investigation of crimes, the dentention of suspects, the management of high risk offenders, the investigations of incidents, the support of both witnesses and victims, the support of both victims and witnesses, and the street-level patrol of individual localities. “manage public engagement – patrol neighbourhoods”. Policing is already privatised in many areas of the USA. Proponents of privatisation in America have argued that it brings down costs, while simultaneously giving detection rates a boost. The justification for privatisation is laid bare by research by the Policy Exchange think tank (a favourite resource of the government). While privatisation will arguably neither increase accountability nor raise performance, what it will achieve is the the maximisation of shareholder profit and ensure a small number of individuals become very rich. The loser may be social justice and community accountability. The Policy Exchange (a favourite government think tank) have pointed to the increasing cost of the police, and argue that policing in England and Wales is among the most costly in the industrialised world. To support this assertion, they argue that UK police expenditure in 2010 cost more than that in the USA, Canada, New Zealand and Australia. From the perspective of the Policy Exchange, the police service continues to be “monolithic – growing in size but not become more flexible or efficient with its staff. With respect to the police’s primary investment – its own people – this has led to a service with a large amount of wasted assets”. These views notwithstanding, private provision of policing in the West Midlands and Surrey at least, will take a huge leap forward by this time next year. With the tectonic plates shifting in favour of privatisation within the criminal justice system with both policing and prisons, can the probation service now be far behind? The Conservative/Liberal democratic coaltion government emphasises the centrality of markets and market processes. The government is both ideologically inclined to, and strongly supportive of, privatisation. We should hardly be surprised that competition for the running of police, prison and probation services may become an inevitable part of this process of wholesale marketisation.